The three brown finishes create a striking gradient look for this rectangular wall mirror. Delightful in a relaxed contemporary living space, this rectangular wall mirror is a dynamic addition. 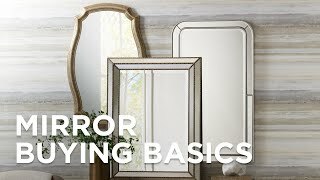 Offering a three-tone finish, this mirror features a wood frame that must be installed vertically. Another beautiful design from Noble Park. 28" wide x 39 1/2" high x 2" deep. Hang weight is 19.2 lbs. Glass only section is 16 1/2" wide x 28 1/2" high. Surround frame is 5 1/2" wide x 1 3/4" deep. Deacon rectangular wall mirror from Noble Park. Three-tone finish. Wood frame construction.